Here is your chance to win a double pass to Barnum the Circus Musical on Sunday April 28th at 6pm, valued at $250. BARNUM, one of Broadway's most treasured musicals, returns to Australia in an all‐new spectacular production. From visionary director Tyran Parke, this new production of a favourite Broadway classic, originally starring Jim Dale and Glenn Close, followed by a London West End production starring legendary Michael Crawford will play an exclusive engagement at Melbourne's most intimate professional musical theatre venue, the Comedy Theatre for a strictly limited time from April 27th, 2019. Starring in the new Australian production as America's legendary circus impresario and unparalleled showman, P.T. Barnum will be none other than Australia's own greatest showman Todd McKenney. Star of Australian stage and screen, Rachael Beck will play the devoted wife of P.T. Barnum, Charity whilst Suzie Mathers will return home to Australia having taken London's West End by storm in recent years, as the Swedish Nightingale Jenny Lind. Also joining the cast playing Joice Heth, is musical theatre star Akina Edmonds. 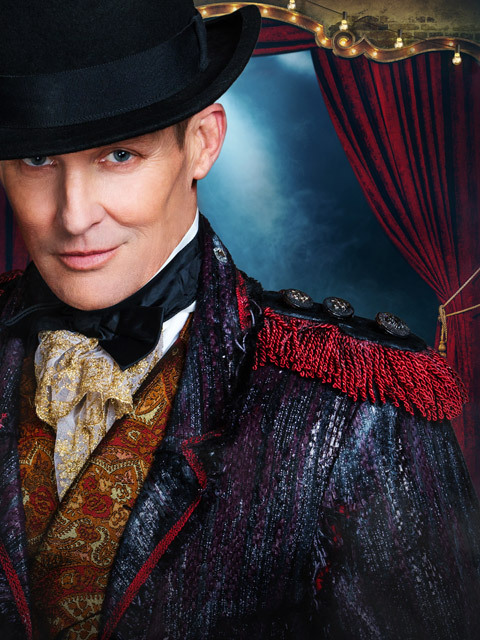 "Barnum is one of those roles in musical theatre that every actor dreams of playing and performing this role has been on my bucket list since 1983 when I first started in musical theatre. It's a dream come true for me to get the chance to play this iconic man in this legendary musical," said Todd. Starring alongside this incredible group of performers will also be Kirby Burgess as the Ringmaster and Joshua Reckless as Tom Thumb. Joining them with extraordinary talents in circus arts are the wonderful ensemble cast including Embla Bishop, Robbie Curtis, Sarah Gray, Matthew Hamilton, Stephen McDowell, Vanessa McGregor, Karlee Misipeka and William Meagher. Based on the life of P.T. Barnum, BARNUM is a colourful, dynamic spectacle with heart, where audiences shall witness the wonders of the world including Jumbo, the largest elephant, Joice Heth the oldest woman to ever live, a great white whale from Labrador, General Tom Thumb only twenty‐five inches from toe to crown, and the rarest and most beautiful bird in captivity the Swedish nightingale, Jenny Lind. Plus, a cast of hundreds, no thousands including marching bands, tumbling bands, flying bands, bands of every size shape and description! This heart‐warming and uplifting musical is a theatrical event for all generations, full of great music, circus, magic and comedy; not to mention Barnum's magnificent tight-rope scene. In collaboration with the National Institute of Circus Arts (NICA), the brand new Australian production is produced by StoreyBoard Entertainment bringing together some of the creative team from its critically acclaimed production Follies, In Concert. BARNUM debuted on Broadway in 1980 where it played for almost 900 performances. A West End production premiered in 1981 at the London Palladium before a successful UK tour in 1985-1986. The first Australian production premiered in Sydney in 1982 starring Reg Livermore. With a book by Mark Bramble (42nd Street), lyrics by Michael Stewart (Hello Dolly! ), and music by Cy Coleman (Sweet Charity). BARNUM covers the period from 1835 through 1880 in America and major cities of the world where Barnum took his performing companies. This reimagined Australian production of BARNUM will be directed by Tyran Parke, with the all Australian creative team also including Choreographer and Musical Staging Kelly Aykers, Musical Director Stephen Gray, Circus Direction Zebastian Hunter, Set and Costume Design Dann Barber, Lighting Design Rachel Burke, Sound Design Michael Waters and Associate and Resident Director Caroline Kaspar. Suspend your disbelief at the theatre door and do not miss this musical or as Barnum himself would say "The Greatest Show on Earth!" From 27th of April at Comedy Theatre, Melbourne. Wednesday & Sunday 1pm, Saturday 2pm. By entering competitions you authorise Female.com.au to add you to our newsletter database, where winners are published. See Terms & Conditions for full details.